In the 90s, the IT world was talking about Enterprise-Scale. It's not that enterprise-scale was anything new. But up until then, the enterprise was the domain of mainframe and minicomputers. Upstart microcomputers – those with the whole processor on a chip – had previously not been capable of enterprise-scale operations. It took a lot to achieve enterprise-scale with microcomputers. The leaders included Sun, Oracle and Cisco with Microsoft, Intel, Compaq and others playing fast-follower. They invented RAID arrays, symmetric multiprocessing, storage area networks, network load balancing and much more in the pursuit of five nines of reliability. As microprocessor-based computers achieved enterprise-scale, pioneers like Google, Amazon, Yahoo!, SalesForce and others pushed right past enterprise into web-scale. User counts were measured in hundreds of millions, storage capacity was measured in petabytes and server arrays numbered in the thousands. Unlike enterprise-scale where key technologies had already been invented by the mainframe world, there wasn't any precedent for web-scale and the pioneers had to invent their own methods. I happened to work at Ancestry.com in the late 1990s/early 2000s and got to participate in some of that invention. But it wasn't until later in the decade before the pioneers started to share what they had learned and build products like Amazon Web Services, Google App Engine and Windows Azure to support the web-scale developer. This is a important issue for education technology. The education industry is a bit behind the curve in moving to web-scale. For example, most learning management systems are built for enterprise-scale. They are intended to be installed on dedicated servers at a college or university's data center and they're architected to handle tens of thousands of students and teachers. What happens when you move to the K-12 market or to community colleges? These organizations don't have the data centers and skilled staff needed to deploy, maintain and backup enterprise servers like these. In the past, their data systems only had to handle a few hundred or maybe a few thousand administrators. Teachers and students didn't directly access the district's data systems. But districts are rapidly bringing all of their students and teachers online. And that means two orders of magnitude more users. Many districts have student counts numbering in the hundreds of thousands. Some get into the millions. And since their technology staffs are already overburdened, they seek hosted solutions, not enterprise-scale servers they have to manage themselves. Hosting a single district might not reach web-scale but a cost effective provider would serve hundreds of districts. And web-scale technologies can reduce the cost to something that districts can afford. Here are some of the principles of web-scale architecture. For purchasers of products and services, these are the things you need to look for. For developers of those services, these are the principles you need to incorporate into your design. Today a district might keep a few dozen data points per student per year. In a district with 50,000 students that amounts to around 150,000 database rows per year. Eventually the database might grow to a few million rows total. But personalized learning applications can collect thousands of data points per student per year. And an online service might serve a few million students. Thus, a web-scale learning service should be designed to store billions of data elements with provisions for orders of magnitude growth beyond that as clickstream data become more important. Today's schools typically run a Student Information System, a Learning Management System and a few custom learning systems for specific subjects. Most of these applications have their own user database mandating separate logins and making requiring a lot of data entry to provision the sytems. The low-hanging fruit is a single sign-on system that lets students and teachers use the same login account across all systems. But single sign-on is of limited value without automatic provisioning. So it's more important to have an identity management system that automatically shares demographic and enrollment information between the Student Information System and the various learning systems. The long-term need is to integrate the data among all of the systems so that all student performance data is accumulated in a common database. Consider security in a Student Information System. The student, her teacher and her parents should have access to her school records, but no-one else (except maybe the principal or a counselor). Enterprise-scale security manages things like this through access control lists (ACLs). Record or element has an ACL granting certain levels of access to specific individuals. For example, the teacher has permission to view and change grades while the student and parent only have permission to view them. The ACL approach becomes fragile at web scale. With millions of students and parents and thousands of changes to class enrollment it becomes difficult to maintain correct ACLs even when the process is automated. Roles and groups offer some relief but inevitably permission errors creep in and they become a technical support nightmare. Even worse, with regulations like FERPA in place, permission errors can result in significant liability. Instead, web-scale applications use policy-based permissions. When a student is enrolled in a class, the policy says the teacher should be able to access that student's records. There's no ACL to be updated and permission naturally disappears if the student changes enrollment. The databases of these systems describe the relationships between elements (students, classes, teachers, parents, etc.) and the policies describe how permissions should be granted according to those relationships. Services-integrated security also means that permissions are enforced at all levels of the system. The UI will control permissions that are offered to the user and the API enforces policy when read or write attempts are made. Thus a rogue or buggy application is still prevented from violating security policy. Developer Note: Policy-based security can be processor and database intensive. The query to determine whether to permit a particular operation can easily be more expensive than the operation itself. This isn't a reason to reject the approach. Rather, use multiple levels of permissions caching to reduce the database burden. 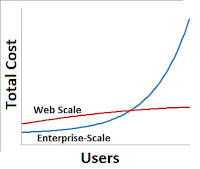 If you graph number of users on the horizontal axis vs total cost on the vertical axis enterprise-scale systems have costs that grow exponentially. This is because they achieve scale by using progressively bigger and more complex servers and one 32-processor server costs many times more lot more than 32 single-processor servers. In contrast, web-scale architectures have a linear or sub-linear cost curve. They achieve this feat by using software, database and hardware architectures that spread the load across many commodity-priced servers. As demand increases you simply add servers so variable costs are linear and fixed costs get diluted over a large number of users. Developing scale-out software like this is complicated and expensive. Because of this, enterprise-scale architectures can cost less in enterprise-scale deployments. 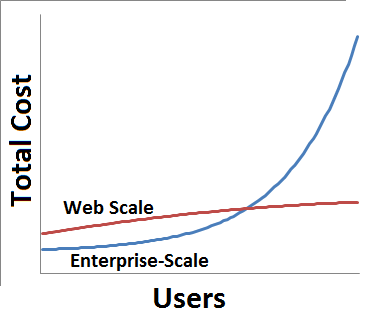 But when user counts get into the hundreds of thousands or millions, web-scale becomes more cost effective. Plus, other innovative applications are likely to emerge. In a realistic system, these components will originate from a variety of sources. For time-constrained teachers and students to use them effectively, they will have to be seamlessly mashedup together. At Ancestry.com we had to invent many of the web-scale tools we used. But the toolkit has matured in the last few years. The easiest approach is to build on one of the cloud platforms like Windows Azure, Google AppEngine or Amazon Web Services. The downside is that doing so locks you into that vendor's hosting service. Ultimately, however, you can use all of these tools and still not have a web-scale application. You have to architect for web-scale from the very start.